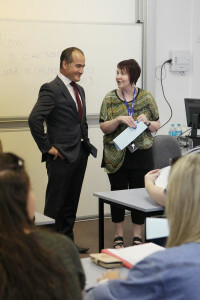 Minister for Training and Skills Steve Herbert and Deputy Premier and Member for Monbulk James Merlino have officially opened the Box Hill Institute Lilydale Lakeside campus and met students on their first day of classes. The opening of the campus is the first stage in Box Hill Institute’s extensive plans to reopen and improve the former Swinburne University site. Box Hill Institute was announced as the new owner of the site in October 2015. The new Box Hill Institute Lilydale Lakeside Campus has opened in partnership with Deakin University and William Angliss, with more than 500 students so far signing up for a variety of courses at the campus. Courses being offered on the site this year include Carpentry, Community Services, Hospitality, Business, Early Childhood Education, Veterinary Nursing and Graphic Design. The Victorian Government has invested $20 million in rebuilding training and higher education in Lilydale, with the new campus to offer vocational and higher education courses and will also include an integrated childcare centre. ate-of-the-art Tech School with leading-edge technology will also be a part of the site. Enrolments in course at Box Hill Institute’s Lilydale Lakeside campus are still being accepted for 2016. Find out your study options at one of our Information and Enrolment Nights.